The number and average size of explosions at the volcano have increased again since Wednesday. INSIVUMEH reported frequent explosions with shock waves and ash plumes of up to 1 km height.  No lava flow is currently active. Ashfall was reported in nearby areas including Panimache (8 km SW), Morelia (9 km SW), and Santa Sofía (12 km SW). During 28 February-1 March explosions generated ash plumes that rose an average of 650 m and drifted 9-10 km W. Incandescent material was ejected 150 m above the crater, and a small lava flow (400 m long) descended the Trinidad drainage. In a special report on 16 February INSIVUMEH noted 4-6 explosions per hour, and ash plumes that rose, based on pilot reports, to altitudes of 7-9.1 km (23,000-30,000 ft) a.s.l. and drifted more than 15 km SW and W.
The lava flow towards the Trinidad and Ceniza canyon on its upper flank remains weakly active, although seems to be decreasing. Guatemala's international airport has resumed operations. According to the observatory of INSIVUMEH, the surge in lava effusion produced two lava flows of 2000 m length from the summit towards the Trinidad and El Jute drainages, causing forest fires. Several pyroclastic flows were generated by partial collapses of the lava masses from the upper slopes and traveled several kilometers. Explosions remain frequent and often strong, producing ash plumes that rise 1-1.3 km above the crater and are accompanied by shock waves that rattle roof and windows in nearby villages. Shock waves rattle ceilings and windows in the villages of Panimache, La Rochelle, Morelia. Strong strombolian-type explosions have been occurring at rates of 6-8 per hour, sometimes ejecting incandescent bombs to more than 1000 m above the crater and producing glowing avalanches. Some of these reached the vegetation and caused small fires. Ash plumes rose to 1-1.5 km above the crater and drifted 10-15 km to the west and southwest.